Wilde Irish Chocolates create, decorate and package their chocolates on the shores of Lough Derg in County Clare. With their dedicated staff, the business is truly artisan with everyone sharing the production, product development and tasting. 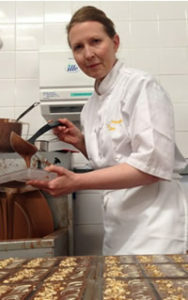 Patricia Farrell went in search of a sweet life 11 years ago and landed on the shores of Lough Derg in East Clare making what some people have called ‘the last good drug’ – CHOCOLATE! Inspired by an iconic Oscar Wilde quote ‘I can resist anything but temptation’ and because she herself could ‘resist anything but temptation’ she followed her childhood dream to make (really eat!) all things chocolate. She originally thought of owning a chocolate shop but realised that this didn’t give enough of the hands-on, or it should really be said, ‘hands-in’ experience that would satisfy. She managed to recruit her husband and a small but similarly dedicated team of women (AKA ‘the Wilde Bunch’) into this chocolate crusade to make real ‘honest to goodness chocolate’. They make a range of 17 different chocolate bar blends, all handmade and therefore uniquely different from each other. Their range of ‘Wilde Irish Organic Fairtrade’ bars is currently available in five blends and is the only Irish made organic fairtrade chocolate. New to the range is their handmade and decorated range of ‘Wilde Irish Artisan’ bars with flavours which range from intensely dark 80% chocolate with raw cocoa bean nibs, to zingy bittersweet Cranberry white chocolate. Their ‘Moments’ handmade chocolate gifts selections contain 12 different individual confections and are available in 12, 24 and 48 choc hand-wrapped and ribboned presentation boxes. They also make 18 varieties of fudge and many more chocolate treats which you can taste at their market stall in the Milk Market and from their own factory outlet shop in Tuamgraney and at many Summer and Winter events around the country. Since they started to hand-make their chocolates on the shores of Lough Derg in 1997 they have dedicated themselves to the pursuit of pure chocolate decadence and achieved the distinction of 5 ‘Great Taste’ Awards in their first 5 years. They achieved Great Taste Gold in 2007 for their Fairtrade Organic Latte & Cinnamon bar and their latest Great Taste Gold in 2008 for their Artisan Toasted Almond and Orange Dark Chocolate bar. Their Artisan bars also won a Commendation in the Confectionery Product of the Show Competition during the SHOP 2008 exhibition, Ireland’s premier retail trade event. They have also been recommended by the Bridgestone Guide, Irish Food & Wine magazine and the Guardian Good Food Guide. They are members of Good Food Ireland.